8 Commercial Real Estate & Properties in New Farm are listed in 2 categories. We have 6 Retail ShopsLease and 2 OfficesLease . Professional office space situated on Brunswick Street New Farm with excellent main road exposure. Fully Air conditioned throughout Both partitioned office and open plan layout to suit a variety of different uses Exclusive Kitchenette Shared toilet amenities with National Tenants Domino's Pizza. Price on Application Call Ray White Commercial TradeCoast exclusive agents for an inspection! Approx. Fantastic Location In The Heart Of New Farm! Contact Agent! 302sqm over two levels (151sqm on each level) plus a further 135sqm exclusive use courtyard area at the rear $497sqm GROSS (incl 8 car park spaces, and 135sqm exclusive use courtyard) On site toilets on upper level Eight (8) exclusive car park spaces plus four (4) in the court yard 1 CAR PER EVERY 25 SQM The ground level includes a fully fitted out commercial kitchen this can be removed. Great natural light and it has area to hold functions. Please call for more info or to arrange an inspection. On offer is this landmark restaurant in the New Farm area. This is a turn key opportunity for an experienced operator. The restaurant has been a successful operating venue for lunch, dinner and special functions. Connected to grease trap and offering overhead exhaust canopy. Key Features: 65 m2 of kitchen, bar and internal dining plus additional alfresco dining. Grease trap connection and overhead exhaust canopy. Situated in a prime corner location. Kitchen equipment available. For more information or to book an inspection please contact your Blocksidge Agents. 61 M2 Shop In Heart Of Brunswick St, New Farm $34,533 Net + GST + Outgo.. This strip shopping centre is Located on the bustling intersection of Brunswick St and Merthyr Rd New Farm. The shop faces Brunswick st and ideal for any retail usage, including clothing store, barber shop or sushi shop. 61 m2 air conditioned shop Concrete floor Priced to lease For more information or to book an inspection please contact your Blocksidge Agents. 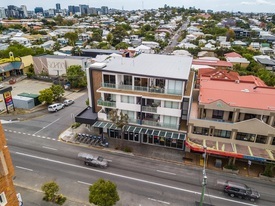 Upper Level Area: 145m2 Recently refurbished On site parking Open plan Signage opportunity Kitchenette Private bathroom with shower PWD & ambulant user compliant Air conditioning Excellent natural light Private access Outgoings: $12,000 (approx.) This recently refurbished open plan tenancy is positioned in New Farm on the busy intersection of Lamington Street & Merthyr Road. This location will deliver exceptional exposure for your business while simultaneously providing multiple private amenities for staff and clients. Take advantage of all this location has to offer your business – Available now! Contact us for additional information and to inspect. 102 M2 Shop Facing Brunswick St, New Farm $66,300 Net p.a. + GST + .. Situated on the much desired Merthyr Road and Brunswick Street corner, this tenancy has absolute exposure. This property has extreme potential for a Food or Retail operator. This property features: Existing Cold Rooms Sinks and Plumbing in place Kitchen Canopy Counter and Servery For more information or to book an inspection please contact your Blocksidge Agents.